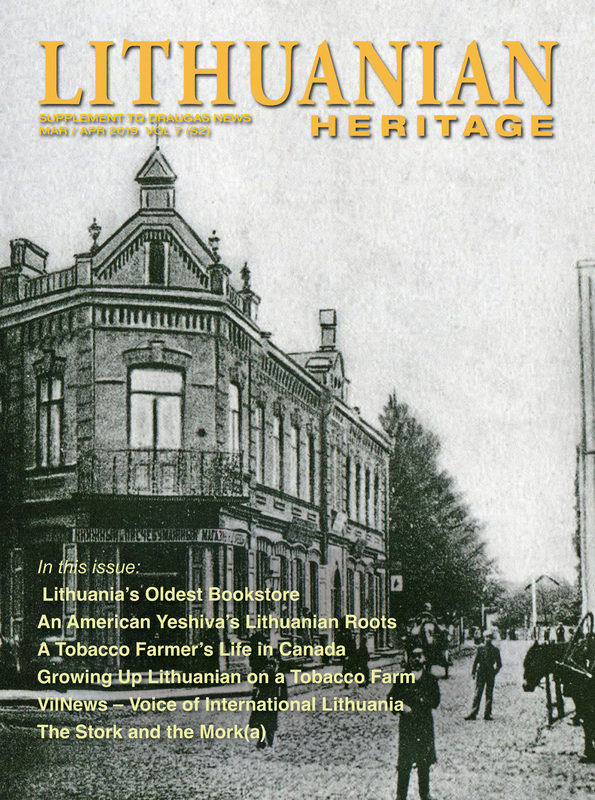 The origin of the Lithuanian name for Easter is the subject of some debate. 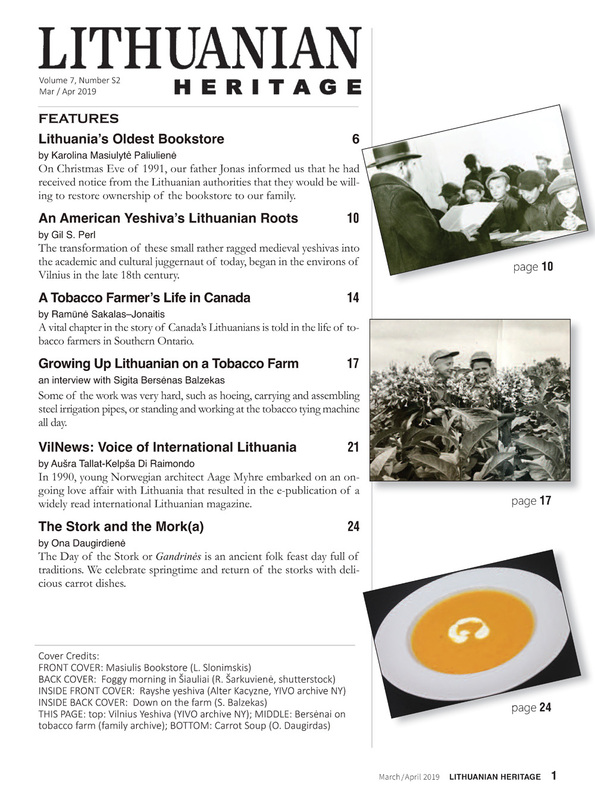 Linguists and etymologists claim that the word Velykos is borrowed from our neighbors to the east, the Belarusians, who call Easter velikij denj – literally, great (or grand) day. But žemaičiai, or Lowlanders, insist that the name comes from velkinis, their word for the first springtime egg. In turn, the Highlanders, or aukštaičiai, maintain that the name comes from vėlė, a word for soul. Traditionally, the people of this region visited the graves of their dearly departed on Easter, after which the souls left for the fields to act as guardians of the upcoming growing season. Whatever the origin of the name, everyone who celebrates Easter knows that it is a period of special customs and of very special food. 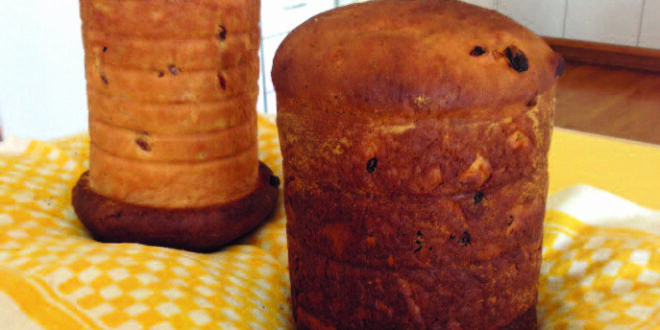 Velykų boba, or what many of us call babka, is one of the most traditional cakes baked at this time and without a doubt, the queen of the Easter table. In olden days, women would commission potters to make special tall clay pots for baking, because the taller their babkas, the better the wheat harvest would be. Historians have found recorded recipes for this sweet raisin bread in the chronicles of Žemaitijos bajorai (Lowland nobles) from at least 200 years ago. Our mothers and grandmothers have been faithfully continuing this tradition, and now it’s your turn to bake a babka. I don’t know if the recipe I am sharing with you is 200 years old, but it’s been used in our family for over 50 years. I do know that it came from a convent in Europe, and that the nuns who originated it definitely knew a thing or two about baking. While there are hundreds of babka recipes available, this one is special. Firstly, because it makes use of a very old baking technique where a portion of the flour is scalded (plikyta). Today there is a lot of new science explaining the rationale behind this. It involves starch gelatinization, gliadin and glutenin, and water molecules leaving and entering the flour protein stuctures. Scalding (called tangzhong in Japan) is now actually becoming quite the fad in bread baking because it results in bread that is especially light, moist and with a fine crumb. I suspect the nuns knew this not from science, but from centuries of collective baking experience. They simply knew that it resulted in heavenly babkas. And the third secret is three risings. There is science behind this, too. But all you need to know is that yeast is a mystery and mysterious things will happen three times. In Lithuania, babka is traditionally baked on Holy Saturday and brought to church with other food items to be blessed. This is how my own grandmother did it, my mother did it, and how I do it. 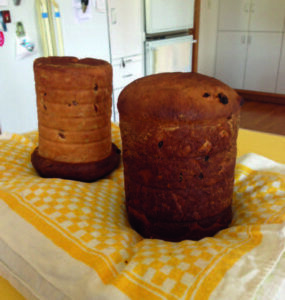 But for many years, my inexperience with yeast-based baking resulted in a very, very long Saturday… Married and living in Chicago, every year on Holy Saturday morning, I would call my mother in Cleveland. “Mom, I’m getting ready to make the babkas,” I would announce with grim resolve, “don’t leave the house and stay close to the phone.” Every year, my mother would laugh and reassure me that everything would be just fine. Of course, her confidence was greatly misplaced… Her babka-support hotline got lots of phone calls. I remember the smell of baking babka that filled the house when I was a child. My mother’s babkas were so light and delicate, that they had to be handled with extreme gentleness. We were not permitted to run around during the rising and baking, and as befits a queen, after removal from the oven, the babkas were enthroned on soft down pillows to cool. I remember the magical moment when my mother cut into the little baby babka she always made for us. Everything else was hands-off until Easter morning, but this bit of heaven was our special early treat. Continuing traditions is a way to respect history, to connect generations and to enjoy the treasures of our rich culture. So this year, let’s do this together –let’s all channel our good baking energies on Holy Saturday and bake! May your babka be the tallest! 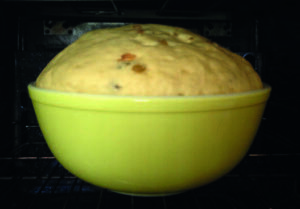 The second rise: the bowl and the top of the dough were well-greased to allow for easy expansion. This dough is ready to be divided into baking pans. My mother made babka using only a wooden spoon, a mixing bowl, and a rotary egg beater. I’ve begun using a stand mixer. You decide what’s best for you. Note that the recipe asks for cups of “sifted flour,” not “flour, sifted.” It makes a difference. 1. Scald 2 cups milk (bring just to a boil). Remove from heat and add 2 cups sifted flour all at once, stirring hard to prevent lumping. Mix until very smooth. Cool. 2. Dissolve yeast in ¼ cup lukewarm milk and 1 tsp. sugar. When bubbly, add to cooled scalded flour mixture and beat in well. Cover and let rise until doubled (first rise). 1. Meanwhile, separate eggs, saving whites for another use. Beat egg yolks with 1 cup sugar until very, very thick and almost white. Melt the butter, cool to lukewarm. 2. Add beaten egg yolks and melted butter to risen sponge. Mix in. Then add 6 cups sifted flour, salt, raisins and citrus zest and mix well. Knead until dough is smooth and blistered and leaves fingers. 3. Cover and let rise in a large, well-greased bowl until doubled (second rise). The third rise: the dough was placed in 1, 2 and 3 lb. coffee cans for the final rise. The smallest babka got a bit too much dough, the largest (in the back) could have used a bit more. The babka on the right is perfect. They are now ready to bake. 1. Get your baking pans collected well before baking day. You can use an assortment of tall metal cans or other oven-proof cylindrical containers in a variety of sizes. Make sure the interiors of the cans don’t have a protective coating. Generously butter the bottom and sides of your cans and sprinkle lightly with plain, fine bread crumbs. 2. 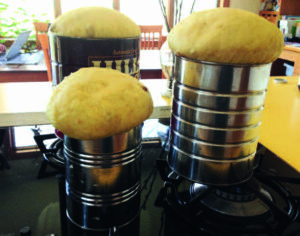 After the second rise, divide dough into the baking cans. The dough is soft and best handled by a gentle two-handed pinching of the appropriate amount of dough. Try not to manipulate it too much. Each piece should be rounded and smooth on top, with any seams tucked underneath. Carefully drop the dough into the cans. It’s a bit of a guessing game to figure out how much dough to put in, but as a general rule, it should fill no more than half of any can. 3. Cover and let rise again until the cans are full (third rise). 1. Before baking, be sure to check the height of your babkas in the oven. If they are close to the top heating element, remove some racks. 2. Preheat your oven to a little less than 350º F. Place the biggest babkas in the back of the oven – it’s hotter there, plus they won’t get in the way of removing the smaller ones as they are done. 3. After about 15 min. of baking, cover the taller babkas with foil to prevent over-browning. Baking time will be VERY individual depending on the sizes of your babkas. You will have use your baker’s judgement for this. As an example, my babka in the 3 lb. coffee can bakes approx. 35–40 minutes; 2 lb. can –– approx. 30–35 minutes; 1 lb. –– about 25 min. Note: Same size cans from different products can bake differently. Perhaps the metal or gauge is different? Be alert and watch your babka and not the clock to assess doneness. 1. After removing from the oven, cool for 5–10 min. in the pans, then carefully slide the babkas out onto a towel-covered down pillow to cool. Carefully change their positions several times during cooling. 2. While the babkas are still a bit lukewarm, spread the cap with an icing made from confectioner’s sugar and a little milk. The amount and consistency of the glaze is your preference. Traditionally, the icing is allowed to drip prettily down the sides. 3. The best way to slice a tall babka is horizontally. First, cut across to remove the cap, then continue slicing generous round slices. These can be divided into desired serving sizes. 1. Babka is best while fresh, but it also freezes very well. Wrapped in wax paper and foil, then placed in a plastic bag, a frozen babka will keep a long time. Defrosted, it tastes like you made it yesterday. 2. The reserved egg whites can be used in a lovely angel food cake (12 egg whites), meringue cookies, or frozen up to a year. Recipes and techniques abound on the internet.